Online marketing changes from year to year and this year is no exception. Sometimes keeping up with all the changes and advancements can be a daunting task. New innovative ideas come alive and old ideas get more attention and power while some just dry up and blow away. We can surmise that marketing methods such as social media and SEM will never go away but changes will take them in different directions. We need to be aware of those new directions so we don’t get lost in our marketing efforts. Below are some of the major marketing trends for this year and how some of them will be changing. 1. 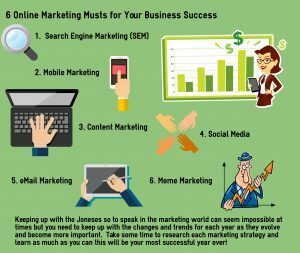 Search Engine Marketing (SEM) – Search engine marketing includes strategies such as search engine optimization and paid search engine advertising. According to the Search Engine Journal, 93% of all online experiences begin with a search engine. Obviously your website needs to be in on that statistic. Search engines drive over 300% more traffic to websites than social media. This year the search engines will be all about quality over quantity more than ever. Your site needs to have quality content and quality inbound links. Concentrate on content that answers people’s questions and links from high-powered informative sites. Keywords will be diminishing in importance as over-stuffing of keywords tends to cause webmasters to lose focus on more important factors such as user experience. 2. Mobile Marketing – Mobile marketing has been like a lion waiting in the bushes. When it pounces, its force will be extreme. This year promises to be a big year for mobile marketing. You have to have a mobile-friendly website as more and more people are going mobile. Almost 80% of smartphone owners use their devices to shop online. And this stat will only get bigger. First thing you need to do is visit your site from a mobile device and take note of everything that needs to be changed, tweaked or redesigned. There are mobile site design services which are free or affordable. If you can’t or won’t make the necessary changes to your site an alternative is to make a mobile-friendly sister site and link it to your main site. This is a better strategy than just ignoring the ever-growing number of mobile consumers. 3. Content Marketing – 2014 was the year that content became king but this year it looks to evolve even further. Content marketing is marketing by creating and sharing information and other quality content. For effective content marketing you need to analyze your audience’s needs and articulate those needs successfully in your content. Visual content such as infographics are becoming very popular and can do a lot for your campaign. Add graphics to your how-to articles for more effect. Creating entertaining and informative videos can also escalate your content marketing. Visual content will go to the next level and become a necessity in content marketing. 4. Social Media – Social media usage has increased over 100% in the last five years and will only continue to grow. If you have not yet gone social, you need to start building your social presence. For most small online businesses, it would be nearly impossible to build a solid presence on all the social sites. Research the social networks and choose the top three that would be the best for your business. Focus on building your brand on these sites by posting consistent, interesting, entertaining, and helpful content. Always respond to comments whether they be positive or negative. Research what types of content draw in the most engagement. Learn all you can about social media and how it works so you have a deep understanding of the power it has and how to bring this power to your business. 5. eMail Marketing – You might have seen the headline, “eMail Marketing is Dead” but email remains the leader in spreading the marketing message. According to emailexpert.org, for every $1 spent on email marketing, the average return is $44.25. Almost 100% of online consumers use email. eMail marketing will become more straightforward and should always be permission-based. Although email marketing is alive and kicking, spam-like methods are dead. Do not use hype and spammy words in your email subject line. Keep it short and to the point. Your subject line is the doorway to your email and will determine if it is opened or not. Be sure your email messages are also mobile-friendly. 6. Meme Marketing – A meme (pronounced “meem”) is a growing and popular internet trend where a cutesy or funny image is paired with a clever quote or saying to create an entertaining or funny situation to which we can relate. Memes are also becoming more popular in billboards and other offline advertising. You can create your own memes at websites like memegenerator.net. They enable you to use your own images and add your own text. Memes are meant to bring humor and entertainment to everyday situations which can go a long way in the online marketing world. They will increase sharing and engagement to help build your social media presence. As always be careful as not to produce and offensive or inappropriate meme. Memes are a fun and interesting way to go viral and take your online marketing to the next level for the New Year. Keeping up with the Joneses so to speak in the marketing world can seem impossible at times but you need to keep up with the changes and trends for each year as they evolve and become more important. Take some time to research each marketing strategy and learn as much as you can so this will be your most successful year ever!